DesertUSA Note: The History Channel is running a series on the Lost Dutchman Mine. My neighbor pointed to the cave  a key landmark  below a ledge  another key landmark  and we soon stood on the site which thousands of people had searched for during the last one hundred and ten years. A curved arrow on a mysterious map inscribed on stone surfaces pointed to the identical place, confirming the location. Now all we had to do was dig, and we would surely find one of the richest and most hunted treasures in the worldthe Lost Dutchmans Gold Mine, secreted in the Superstition Mountains east of Phoenix, Arizona. It all started one winter day in 1994 when my wife and I stopped in a rock shop in Holbrook, Arizona, where we purchased a copy of Fool's Gold by Robert Sikorsky. (The book has since been reissued under the title Quest for the Dutchmans Gold.) Little did I know how much that book would change the course of my life, for that was where I first discovered pictures of the enigmatic Peralta Stones, several small slabs bearing finely incised images, several Spanish words (some misspelled), a heart-shaped cutout and a heart-shaped inlay, and apparent map lines and symbols. 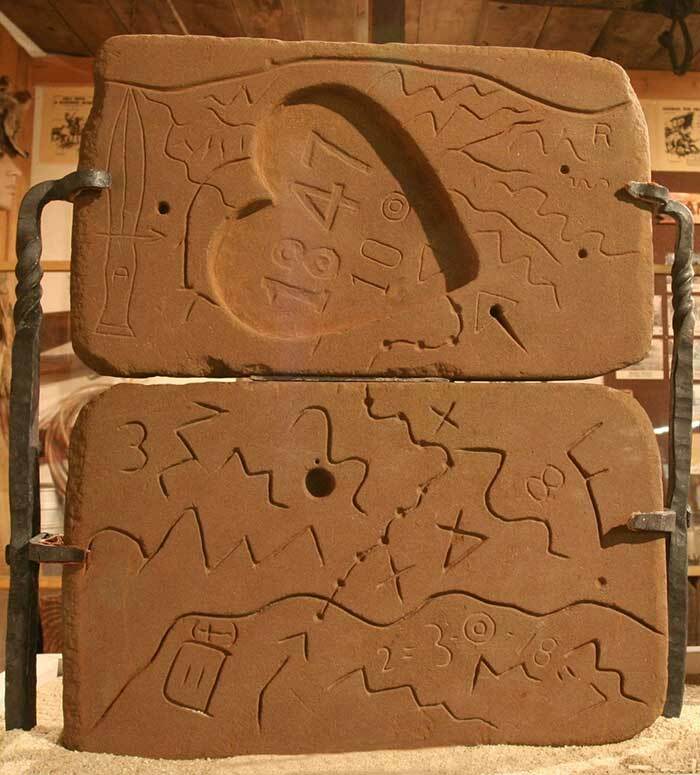 These stones, found mysteriously in the Superstition Mountains in the mid-20th century, purportedly hold the key to the location of the fabled Lost Dutchman. I was especially fascinated by the symbols and the details of the map. It looked like a great puzzle, but in Fools Gold, there were stickers placed over some portions of the stones, obscuring details. That irritated me, but for some time, the map stayed in the back of my mind. In March 1995, my wife and I were in Tortilla Flat, Arizona, where we purchased a copy of The Sterling Legend by Estee Conatser. This book had drawings of the Peralta Stoneswith no stickers. I could now see all the details. 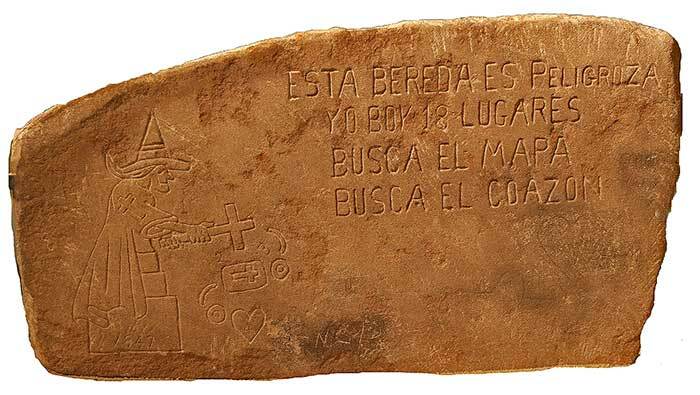 One of the stones, sometimes called the "Priest Map Stone," shows an image of a priest (or a witch) with a cross next to a few brief sentences in Spanish with misspellings. Translated, in context, the words say "you go eighteen paces" (after reaching the trail’s starting point); "the [canyon] wall is dangerous;" "look for the heart," a reference to a hidden heart, an emblem over the image of a horse incised on one of the other stones; and "look for the map," a reference to a second map hidden within the map incised on yet another stone. 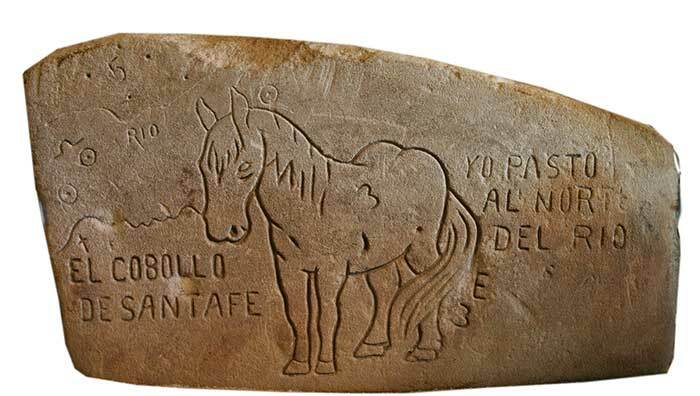 A second stone, called the "Horse Map Stone," shows the image of the horse, beautifully incised, and brief comments in Spanish. Translated, the words appear to say, "horse of holy faith" but actually mean "knight of holy faith," which is a clue to the identity of the person who created the Peralta Stones; and "I pasture north of the river," which is a clue to the trail’s starting point. A third stone, the "Trail Map," bears disconnected lines and symbols on one side and the badly worn word "DON" (the Spanish word for "gift" or "grant") on the reverse side. A fourth stone, the "Heart Map," has disconnected lines and symbols, a heart-shaped cutout and a dagger outline (which serves as a directional pointer) on one side. The surface inside the heart-shaped cutout has the year "1847" and several symbols engraved into the stone. The Heart Map has a cross  a symbol for a church  engraved on the back side. Combined, the word "DON" and the cross mean "church grant." The heart-shaped inlay stone, called the "Heart Stone," has strange symbols engraved on each side. Laid side by side, the Trail Map stone and the Heart Map stone, with the Heart Stone nestled into its cutout, appear to be related. Judging by the workmanship, I suspected that at least two different people produced the various images on the stones. With the clues on the Peralta Stones, I set out to solve the mystery of the location of the Lost Dutchman’s Mine. I contacted the A. L. Flagg Foundation, the curator of the stones, in Mesa, Arizona, to find out whether I could see them first hand. The person I talked with informed me that I needed to get permission from a board director. I asked how to do that. The person said that the information was unavailable. Looking again at the photographs and drawings in my books, I decided that I really didn’t need to see the real stones. 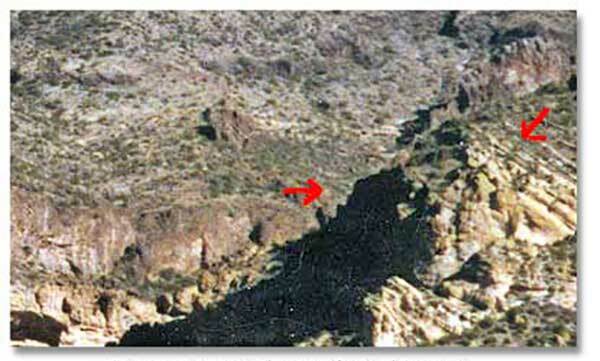 The images gave me all the detail I really needed to solve the mystery of the location of the Lost Dutchman. What I should have done at this point was go see a shrink. But not me, I was hooked. Over the next three months, I convinced myself that I had found not only the trail’s starting place but also its end. During this time, I realized the map had been carved on the stones not once, but twice, by two different people. In both instances, it gave cryptic instructions for how to follow the trail. In light of this discovery, I examined the images of the stones carefully with a magnifying glass and found very faint numbers all over the map, none of which seemed to be of any use as far as I could tell. I decided that whatever had been incised into the stone surfaces originally had been abraded off, leaving only traces of meaningless images. I also found that the side of the stone with the word "DON" on it and the reverse side of the heart stone had not been altered, and the images offered no apparent useful information. It was the map on the stones that showed the trail into the Superstition Mountains, where the famous Lost Dutchman Mine was supposed to be. By September of 1996, I had not yet actually been to the Superstitions to check my theories about the map, so my wife and I took a trip to the mountains. We would hike to a place I thought I might be marked by the map on the stones. It did not come easy. We had to hike through a lot of scrub brush and cacti, walking over pea-size pebbles which rolled like marbles when we stepped on them, making the going tough. It seemed that for every foot we traveled forward, we traveled five feet sideways. As it turned out, I could not connect the first place with the map, but I knew there was a second possibility about half mile away. My wife had had enough of the heat, brush and pebbles, so she headed back to the car. I hiked the half mile. The second place appeared to fit the map! That was the first time I believed I might be able to solve the mystery, but by now, I was completely exhausted. I decided to call it a day. I headed for the car. The next day I returned with my wife to the second site. She took photographs while I tried to correlate what I saw on the ground with the symbols and lines on the map. I got nowhere. I felt sure that we stood at one end of the trail, which is indicated on the map by a doughnut-shaped symbol, but we could find nothing else which seemed to tie to the map. Since we were walking primarily on bedrock, there just wasn’t much of anyplace for a hidden mineshaft or anything else. I looked for some kind of possible trail marker and could find none. I realized now that I may not have found the site indicated by the map after all. There were other locations where it could be. It would take years for me to realize that the map indicated only an approximate location. There was no specific trail marker at the site indicated by the doughnut symbol. Such a thing would have saved me a lot of trouble. 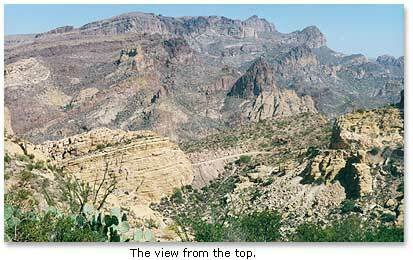 I did wonder about a tall peak to the south and a small canyon running into a large canyon. Both the canyons were brushy with a lot of boulders, making them almost impassable, but one did have a ledge  a possible trail?  high on a stony wall near where the stone map would appear to lead, but I suspected that this is typical of the kinds of possibilities your mind invents in a search for the Lost Dutchman’s Mine. There must be similar "clues" all over the Superstition Mountains. At length, I began to believe that the Lost Dutchman could only be a figment of someone’s overactive imagination. I wasn’t going to fall for it. I was just not going to go on that wild goose chase. No, not me. My wife and I called an end to our trip. I gave up on the stone map. Obviously, it was just another scam. This trip was a lark. We had a lot of fun. It was worth it. I put the whole thing out of my mind. Pretty much so, anyway. We headed for home, a small community of about 350 permanent residents whose ability to divulge a secret is restricted only by the limitations of the telephone. They’ve always looked at me kind of strangely, but it’s never bothered me. There aren’t many straight people in the entire town. When we returned home, my wife sent her photographs off to be developed. We got them back and I didn’t see anything unusual about them except they were very good pictures. My wife is an amateur photographer and sometimes has her best shots enlarged and framed to hang on the wall. She selected one of these for that purpose, and it hung in its appointed place for two or three weeks. For some reason, one night I took the photograph down for a closer look. I caught my breath. At the very edge of the photo, I discovered a pair of eyes in a very vague stone face. This was no ordinary pair of eyes. They had pupils surrounded by white. They looked like real eyes, with the meanest stare I have ever seen. Our collection of books on the Lost Dutchman had grown since I discovered the Peralta Stones in Sikorsky’s Fools Gold, so I dug one of them out and discovered a face was part of the legend. I began re-checking the information I had about landmarks and the features which were supposed to be near the mine’s location. I learned that the mine was supposedly located on a ledge high on a canyon wall just a short distance up from where a small canyon runs into a large canyon. Both canyons were almost impassable because of brush and boulders. A stone face appears where you turn off the main trail or two hundred yards directly across the small canyon from the mine. Too much information matched. This couldn’t be a coincidence. I tried to remind myself that the Lost Dutchman was just a figment of someone’s overactive imagination. I wouldn’t fall for that. I wasn’t going on a wild goose chase. No, not me. I returned, with my brother, to the site marked by the doughnut symbol in May of 1997. This time, we found a relatively easy route to the location. Late on the second day, we found a place where there might be a mineshaft. It was at the base of a small hill with an almost vertical wall. There were a lot of loose and unstable rocks near the top. It was dangerous. The rocks would have to be cleared before we could work safely in the area below. It was getting late. We had to leave. More searching would have to wait until the next trip. Months would pass before I could arrange another trip. That was pure torture, but I would get used to it. It would happen regularly for the next three years, a time during which my wife would continue to believe in me even if she couldn’t really understand me. She did rib me a lot, possibly to cover her anxieties about my trips to a place she considered dangerous. She felt better, however, because I took good solid people with me to help in the search. The rest of the family figured that I was bonkers. During the next trip, with a friend and his son in November 1997, we ran into heavy thunderstorms. The rain followed us almost all the way to the Superstitions. As we passed through the mountains west of Globe, the rain became sporadic. When it finally stopped, the water running off the rocks was a glorious sight, worth the trip in itself. When we arrived at the campsite, I began unloading and setting up our gear. My friend began assembling the tent. He had just acquired this tent at a garage sale. He had no instructions. The thing had mesh sides with a plastic top. He called me over. Something was wrong, he said. I began laughing. He had erected the tent upside down. It made a very good playpen with a ground sheet, but it had no roof. We had just gotten the tent straightened out when another hard rain began to fall. We jumped into our vehicles, where we spent the night because we didn’t have time to trench around the tent, and the rain lasted well into the night. We would have been drenched had we tried to stay in the tent. The next day we went out and set to work. We had to clear the rocks from above us, and then we started to dig. We were only about five feet from the rim of the canyon wall, which had more than one hundred foot vertical drop. At the end of the day we returned to camp, where our wives joined us. The next day we worked about three hours and hit bedrock. We called it quits and just sat around, discouraged. I was extremely disappointed. For the second time, I completely gave up on finding the mine. The Lost Dutchman could only be a figment of someone’s overactive imagination. I wasn’t going to fall for it again. I just was not going on that wild goose chase. No, not me. I put the whole thing out of my mind. Well, pretty much so, anyway. While we were sitting at our camp, we noticed two people with metal detectors crawl into a cave about a quarter mile up the small canyon. We didn’t even know there was a cave there. Later that afternoon, we saw two people from the search and rescue service crawl into the cave. They left about 30 minutes later. We never found out what happened. That cave, however, might serve as a landmark for the Lost Dutchman. But at that point, I didn’t care. I figured that the chance of me finding anything was remote. When we explored the area further, we did find signs of a mountain lion’s killthe still-greasy skull of a javelina, its tusk recently broken. The story was pretty clear. The lion had killed the javelina all right, but that collared peccary did not go gently into the night. Over the next few weeks, another friend studied the Peralta Stone map, and he wanted to go out to trails end. By now, I had no enthusiasm for it. I didn’t want to continue a wild goose chase, but for some reason, I agreed to go. On that trip we explored a wide area and still found nothing. On the trip home, however, my friend asked if the curved arrow on the map could be an extension of the trail. Bells began going off in my head, and I realized that I had never reached the end of the trail. I had been looking in the wrong place! Obviously, the small canyon merged with the large canyon where it made a curve, creating a long narrow point between the two. On an earlier trip, we had found a place where we could climb from the top down to the next level of the large canyon. It was only about an eight feet vertical drop, and it had foot- and handholds. The only problem was, it led into the large canyon, and we needed to be on the other side of the long point in the small canyon. We had not seen any way around the point. Over the next several months, I made four more trips, trying to find a way to get from one canyon to the other. The map told me where I had to descend from the top. It was the same place we had previously found. I just couldn’t find a way around the point at the level where I believed that I needed to be. On the next trip, my wife and I planned to take pictures from a short way up the small canyon. When we got there, a forest fire was burning in the Four Peaks wilderness area just a few miles away, creating a large column of smoke overhead with the upper winds pushing the smoke down into the canyons in the area. We shot the pictures anyway but with little hope of them turning out well. The angle was bad so we hiked around the head of the canyon and down the other side to a place directly across from the ledge, where we took more pictures. The pictures turned out better than we expected, but they did not show a way around the point or anything else I could use. They did show a vague outline of a horse on the canyon wall, but the head was missing from just below the ears. An earthquake in 1887 had altered the area a lot. What remained of the figure of a horse was not much as a landmark. No eyes or face this time, either. 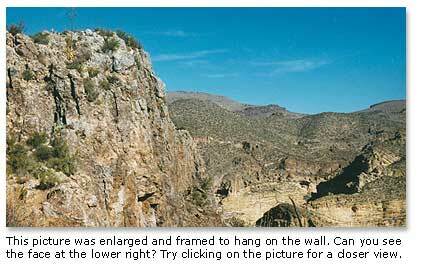 On my next trip, I planned to hike down the large canyon to see if there was a way from the bottom up to the ledge. 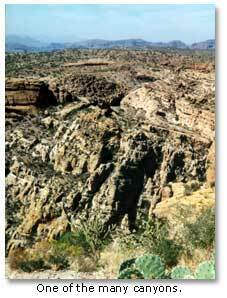 It was about two miles as the crow flies from the head to where the mouth of the small canyon was located. How much distance the bends and curves would add was impossible to know. I made camp near the head of the canyon and started out the next morning. A short distance down the canyon, I found a cave that fit a description I had read. The only thing missing was a rock house that was supposed to be in the cave, but a flash flood or even some person might have destroyed the rock house. I had left the camera at home (as usual), and the cave wasn’t included in the day’s mission anyway. It would prove to be the only place in the whole area that provided shelter, water, firewood and nearby grazing for livestock. All necessary for long-term habitation. On inspection, I found that the cave’s floor had two manmade holes that would hold about three gallons of water each, and if walled in, the cave could serve as a fortress. The hiking was very slow and after about four miles, I could see that I had no hope of reaching my destination within the day. The only thing to do was return to camp, and reaching it before either the daylight or my legs gave out was an iffy thing. Spending a night in the canyon wasn’t appealing, but it would not have been disaster. I had food and water. About dusk, I dragged myself into camp exhausted but otherwise no worse for wear. The canyon was eliminated as a way to get onto the ledge. I knew that there had to be some way to reach the ledge. I went back to the stone map. This time, I found a possible place to descend from the top, enabling me to make my way around the point. On the next trip, that’s what I did. Once I descended from the top, I felt as if I had entered a whole new world. I had to clamber either up or down steep inclines while going around a very slanted canyon wall. Huge boulders, brush and cacti covered the area. There was little room to maneuver. The pea-sized pebbles that rolled underfoot were everywhere. I had to move with great care. This was wild country, unlike anything I had ever encountered. Finally, reaching the junction of two canyons, at the end of the point, the view was stunning. It extended two miles in length and a mile in height. I could see into the bottom of the large canyon 500 feet below. The opposite wall extended upward another 800 feet. The color was overwhelming. Extraordinary rock formations were everywhere. Later, I would see a helicopter down in the canyon. It looked as small as a dragonfly. I found that I was too high. I had to make my way carefully down to where there was a passage around the point. When I reached the other side, I found that I was 20 feet too low. I still had a steep climb up to reach the ledge. The ledge was shaped like a backward comma with the round part about one hundred yards across, the tail was about 20 feet wide. It tapered to two feet where the trail came onto it, and it slanted steeply toward the outside. A vertical canyon wall over 100 feet high extended above the tail. Giant boulders covered the ground, but there was not much brush or cacti, so it was a little easier walking on this side. About half way up on the canyon wall was a small ledge. At this point, I suspected that a crescent landmark on the Peralta Stone map would show the way to the mine. After searching the ledge and canyon wall, however, I found no indication of any mining. The only things I found were some prehistoric potsherds, including a part of a vessel’s rim. From the curve, I could tell the mouth of that jar had been about 12 inches in diameter. A container of that size, I guessed, must have been used to store food. It would have been a difficult task getting it where it had been broken. Finally, I did discover a boulder that would serve as a bridge to the trail which would lead to the end of the point, just where I believed I wanted to be. Read part II of this article on the Lost Dutchman Mine. Barry Storm's Jade Mine researches Barry Storm, the author of Trail of the Lost Dutchman, first published in 1939. In 1957 he came out to California and was wandering around in the desert near Joshua Tree National Park. He chipped off the corner of a rock and discovered it was jade. Thinking he'd found the source of the ancient Mayan's jade, Storm mined and lived in that area for the rest of his life. Join us on our road trip to see Barry Storm's Jade Mine.